Recently Japan law regarding bicycles has been strengthened, and it is a popular topic on TV ”wide shows” (variety shows) as I write this, in Autumn 2011. The scapegoat being used by the media is “fixies” or the fashionable piste-style bikes that usually have a friction brake in the hub. I haven’t ridden a friction brake bike since the 6th grade, but the way it works is you stop by reverse-pedaling, or by skid-sliding. A Big Deal has been made about how evil fixie riders are, emphasizing their delinquency and propensity for riding with no brakes. So fixie riders in Japan have been dutifully putting caliper brakes on, lest they get stopped by the overzealous cops. Personally, I think the root of all evil is the mama-chari (cheap utility bike that moms ride) being driven by drunk salarymen, kids texting or listening to music, or the elderly, but anyway, the whipping boy du-jour is the fixie rider. So I thought I’d post, to organize some information about the situation and laws as I can understand them, and in hopes that this will help hapless gaijin everywhere in Japan. Just to give some background, I ride an urbanized mountain bike from Centurion, which I bought when I was not sure if I would like cycling. I wanted something decent, but that would not break the bank. Well, I really came to love cycling, and started upgrading my MTB, adding nice Mavic rims, a new Shimano Deore XT groupset, a light saddle and seatpost, and a carbon handlebar to name a few. The bike is lighter with the new components, but certainly it is more of a slog to ride compared to a road bike. 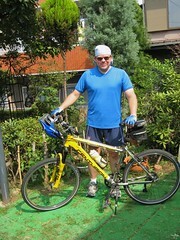 Well, I’m busy with work and as much as I would love to ride daily, I am a “weekend warrior”, usually cycling here in the Kanagawa area, especially down south to Shonan and up north to around Machida or Sagami-Hara. The bike roads are pretty good, the terrain varied, and the scenery is nice and rural. I love it! Bike helmets are not required by law, but are “strongly recommended”. Roads are often pretty narrow, and even when they aren’t, you have people who are not so aware, who edge close to the shoulder, making it difficult or dangerous to proceed on the left. I unclip in these cases, and just have to wait for traffic to flow, or, sometimes go up onto the sidewalk. There’s no rule you have to use hand signals but I always do. Mostly, people see them and yield to you, but sometimes people don’t quite get it, and even though you have right of way and are signaling a turn, they come barreling through. I have noticed that “bike roads” tend to morph. One excellent one without too many gate barriers is the Yamato-Fujisawa Bike Road. This used to be marked as a pure cycling road, but there must have been an accident, because a couple years back, they started putting up signs every 200m or so, to be careful of pedestrians. The likely scenario is that some lamebrain stepped out in front of a cyclist, going down the cycling road at 40kph, so the local civic groups petitioned for the signs and a change in the nature of the road itself. Now it is still marked as a cycling road, but it has pedestrians walking down it. I draw the line at people have picnics on the bike road, though. I pulled an “angry gaijin” on the group of ladies having a picnic literally in the middle of the bike road ( ! ), the other week. This is not a park! When considering cases in which an accident caused bodily harm, it appears that in terms of responsibility, cars > motorcycles > bicycles > pedestrians. That means, if a car hits a bicycle or pedestrian, the car driver is always responsible and at fault, no matter how boneheaded the action of the cyclist of pedestrian. Same goes for you, on a bicycle. Heaven forbid you hit and seriously injure someone while you are on your bicycle. There might be some exception once in a blue moon, but they pretty much spell it out that the cyclist would always be at fault, and we hear horror stories of the cyclist getting jailed, and his family having to pay off massive debts. This can be more than a little bit nerve-wracking and knowing Japan, it’s not an urban legend either. It’s probably a good idea to make a couple points now, about how Japan often is. First, there’s the concept of shared guilt. If you are involved in a fender-bender with another car, there is one case in which you won’t have to pay. That’s if the other guy admits 100% guilt, and the cops are kind enough to write that down. But most of the time, in the case of an accident, the insurance companies get in between, and start the “you’re half to blame” dance. This would also happen in the case of two bicycles colliding. Probably, if both parties are genuine, and trying to help each other, it will end up amounting to nothing. But if you slam into a child or an elderly person, you can bet you will be entirely to blame, even if it is entirely their fault. Enough said. Second, when there’s something that gets peoples’ ire up, you might see an overreaction or over-adjustment by police or by society in general. When some kid got killed by a crazy guy with a knife a few years back, it was found out that the guy jumped out of a tree. The response? Cut all trees back, so they look like ones from a Dr. Seuss book. Our city underwent serious uglification after that child got murdered. The point is, these laws just got strengthened, so don’t be surprised that cops here and there in Japan will be extra vigilant in enforcing the rules.